Home » Annetarsia Knits » Pussyhats Galore! I have been continuing to knit Pussyhats, and they find homes as soon as they are off the needles. The local stores are OUT of pink yarn, so I have been ordering pink yarn from wherever I can find it on the internet. I look for Super-bulky acrylic, to keep the cost down and for easy care. I bought a big bag of Barrington Chunky acrylic from Woolridge Fiber and Craft. It is nice yarn, but not as bulky as I would hope, so I crocheted those hats to save time, using the ” ” pattern. My new batch of yarn is Craftsy “Sprightly”, and fluffy acrylic Super Bulky which is working out really well. I have used several patterns. A new pattern slows me down a bit, but makes the process more interesting. 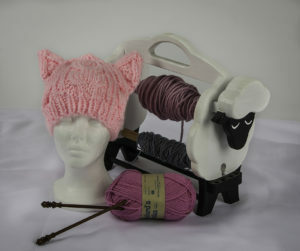 The patterns I’ve used so far are the original Kat Coyle Pussyhat, and most recently, and Cabled Cat Ears hat , by Lorna Watt. The crocheted pattern I used is Kitty Ear Beanie , by Cayla Mullins. It is thrilling to me to see the large number of pussyhat patterns on Ravelry – all free, all encouraging knitters to use their powers to promote the importance of standing together and peacefully pushing for awareness of what is happening in our world and standing up for what we believe in. I see the hats as a positive, fun message that works both when you see one on the street, or massed together at a march. I’ve seen lots of hats: sewn, woven, knit, crocheted, embellished…you name it. All hand-made, which conveys a powerful message in these times where instant gratification and disposability seem to reign. See HERE to peruse the many available patterns for Pussyhats on Ravelry. Appreciate the talent, passion and generosity of knitters. I plan to keep knitting pussyhats for awhile – not full-time, but enough that I can keep a few of them on hand to give away. So far, they fly out the door as soon as off the needles, and I can’t even keep one for me! Next up, I want to knit myself a “DNA on my mind” hat, for the March for Science. At Stitches West I bought the yarn for it, Shepherd’s shade worsted. This worsted yarn will take more time to knit, and I only have 1 ball. This is ear-marked for me, and I hope I get to wear it at least once before I inevitably end up giving it to someone!